So many things in the modern world compete for our attention. Let 5-Minute Yoga help you strengthen your ability to shut out distractions. Whether you love yoga but can’t find time to get to a class regularly, or just want to try a few poses at home, 5-Minute Yoga is here to help. Yoga can help you strengthen your body, quiet and focus your mind, relieve tension, increase your awareness, improve your quality of life, and change how you see the world. It truly has a profound and lasting effect on how you treat yourself and others. Time spent doing yoga is an opportunity to focus on yourself completely and to reconnect with yourself on many levels. If you are like most people, you just don’t have time for an hour-long yoga class at a studio across town. Instead, you need simple, quick ways to incorporate yoga into your life. With that in mind, each of the one hundred sequences in this book incorporates basic yoga poses that together can be completed in just 5 minutes or less. Whether you’re looking to boost your energy levels, find inner peace, lose weight, or strengthen your focus, you’ll find easy sequences in this book that will improve your life—physically and spiritually. 5-Minute Yoga will help you become centered, calm, rejuvenated, and better able to face life’s challenges, big and small—5 minutes at a time. So many things in the modern world compete for our attention. Let yoga help you strengthen your ability to shut out distractions and put your mind back in charge of your attention. After doing this sequence, you will find yourself better able to concentrate on the tasks ahead. 1.Mountain Pose: Stand tall, inhale, and reach your arms straight up to the ceiling. Go down through the soles of your feet and squeeze your inner thighs together. Keep your lower ribs in and turn your pinkies inward to relax your shoulders away from your ears. Take 10 full breaths (1 minute). Return your arms to your sides. 2. Standing Forward Bend: Exhale and hinge at your hips. Let your torso drape over your thighs and reach your fingers toward the ground, bending as far as you can comfortably to release your lower back. Take 3 full breaths (15 seconds). 3. Plank Pose: Exhale, plant your hands palms down, shoulder-width apart, and extend your legs behind you. Place your feet hip width apart with your toes pointed down. Create one long line of energy from your heels to the top of your head. Inhale. 4. Cat-Cow: Exhale and drop down to your hands and knees. Inhale, drop your belly, and arch your back, raising your tailbone. Lift your gaze as you find expansion across your chest. Exhale, arch your spine up, and lower your tailbone. Let your head hang heavy and look down between your thighs. Take 10 full breaths (1 minute). 5. Bound Angle Pose: Sit up tall on your mat. Bring the soles of your feet together in front of you and let your knees drop out to the sides. Hold your feet in your hands and pull them in toward your inner thighs as far as you can comfortably. Bring your arms in flat against your torso and place your fingertips on the mat behind your hips. Take 20 full breaths (2 minutes). 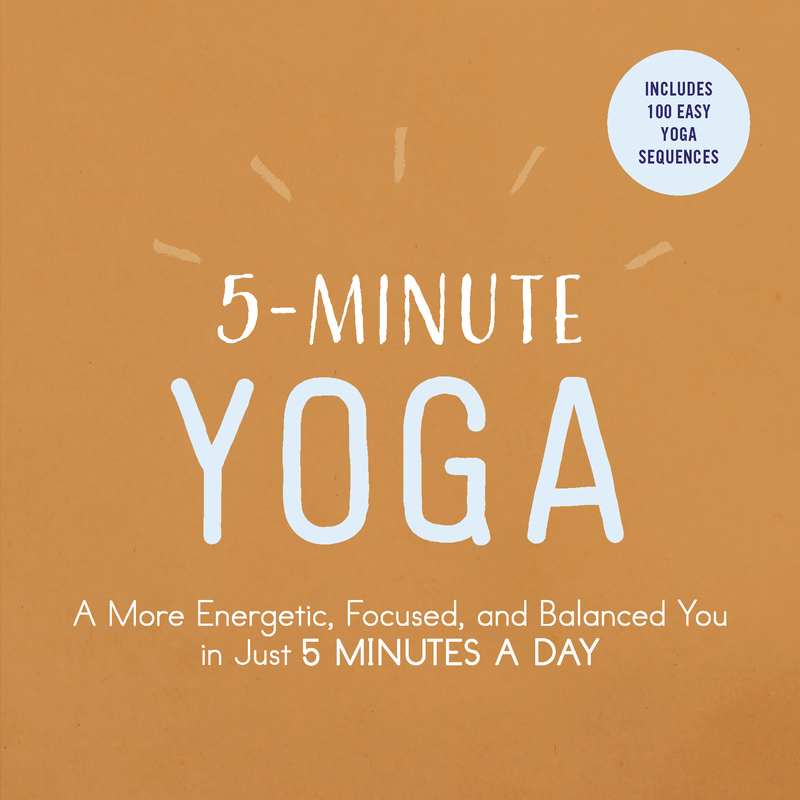 Excerpted from 5-Minute Yoga: A More Energetic, Focused, and Balanced You in Just 5 Minutes a Day Copyright © 2018 Adams Media, a division of Simon and Schuster. Used by permission of the publisher. All rights reserved. Adams Media provides helpful, funny, and inspiring books on a wide variety of topics, so no matter who you are, we’ve got you covered. Our editors are just like you—living, loving, and learning every day. Our personal experiences and expertise in our given book categories allow us to bring you some of the best content on the market—from parenting to relationships, to the paranormal, cooking, and humor—we cover what you care about. New To Yoga? Here’s What You Need To Know..
What’s the difference between meditation, savasana, yoga nidra, restorative yoga, and sleep?